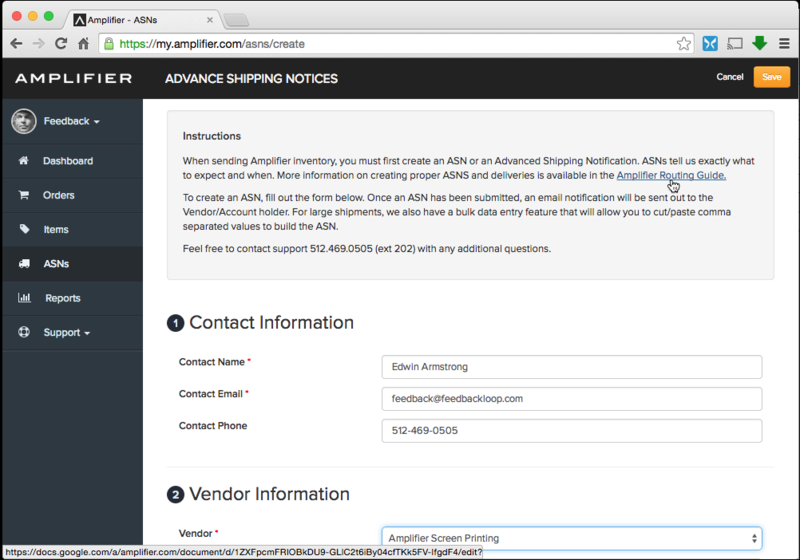 Once you or your supplier is ready to ship inventory to Amplifier, an ASN must be created. Physical: Printable labels to affix to incoming inventory corresponding to the digital record you created. The greek philosopher Heraclitus once wrote the immortal words "Panta rhei" which translates to "everything flows." 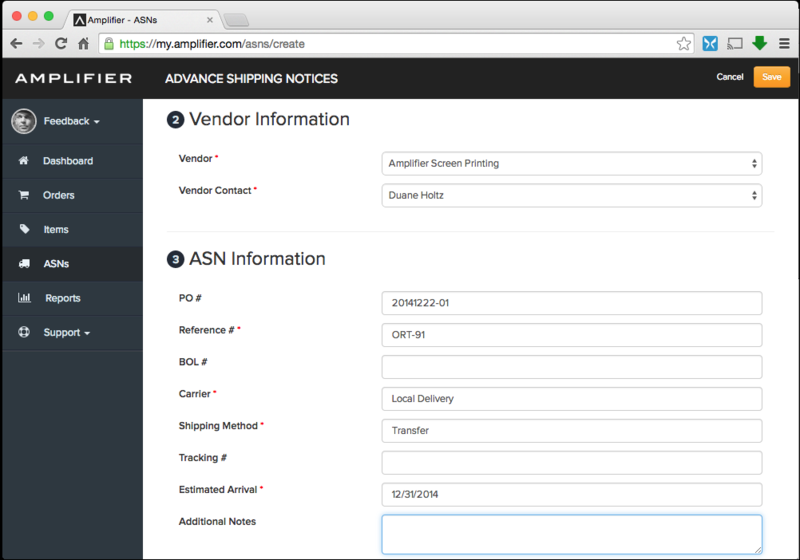 ASNs ensure your inventory flows smoothly into Amplifier. Creating ASNs is easy. Simply click the ASNs button (Truck Icon.) You'll be taken to this screen. What are You Shipping to Us? Tell us who is creating this ASN and how we can contact them in the event we have questions about this ASN. Additional Notes - Anything else we need to know about this shipment. Part IV - What Are You Shipping To Us? Boxes Only - When only sending us a few boxes, choose "Boxes Only"
Pallets & Boxes - When you or your supplier is shipping inventory to Amplifier on pallets, select "Pallets & Boxes." 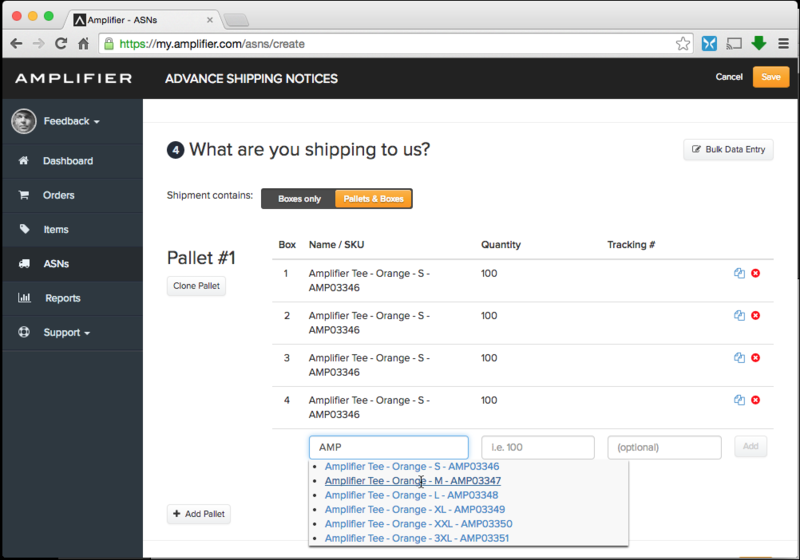 Let's assume you are sending Amplifier a Pallet. Select "Pallet & Boxes" and you will be given a chance to begin building "Pallet #1." 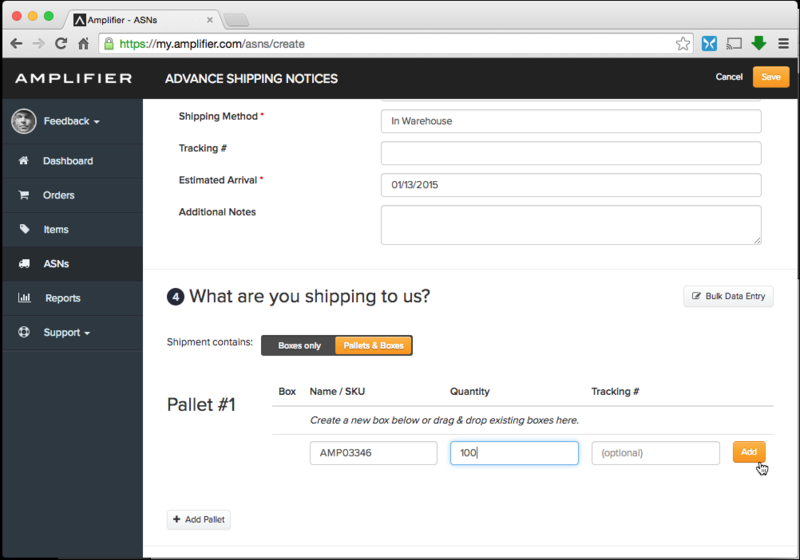 You or your supplier can now begin telling us, BOX by BOX, just what you are sending to Amplifier. Continuing with our previous example, we now have 6 distinct SKUs in our catalog representing the sizes of "Amplifier Tee - Orange" from Small through 3XL. 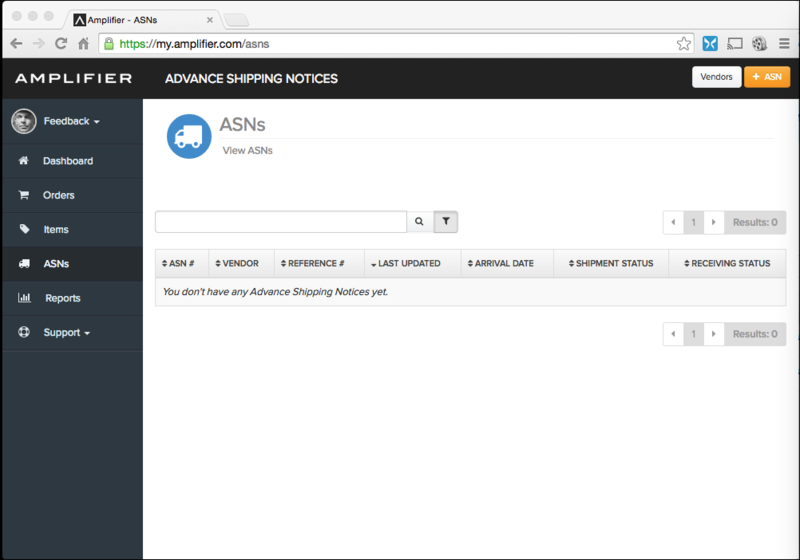 Since we added those ITEMS to our Catalog, they are now eligible to be sent to Amplifier via the ASN Tool. Begin by typing the name or SKU of the first Item you are sending. After you enter a few characters, Amplifier will begin retrieving possible matches. 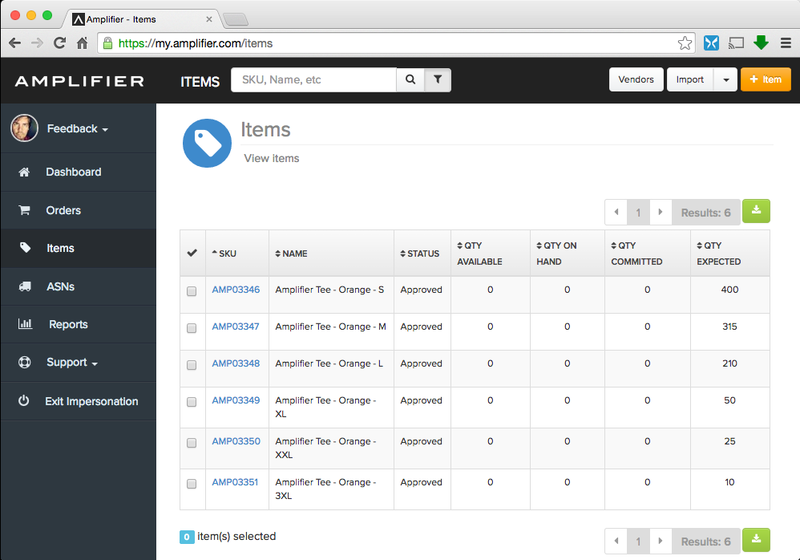 In the example above, we typed "AMP" and were shown all six ITEMS we recently created. Select the first SKU you wish to add. This will become "Box #1." 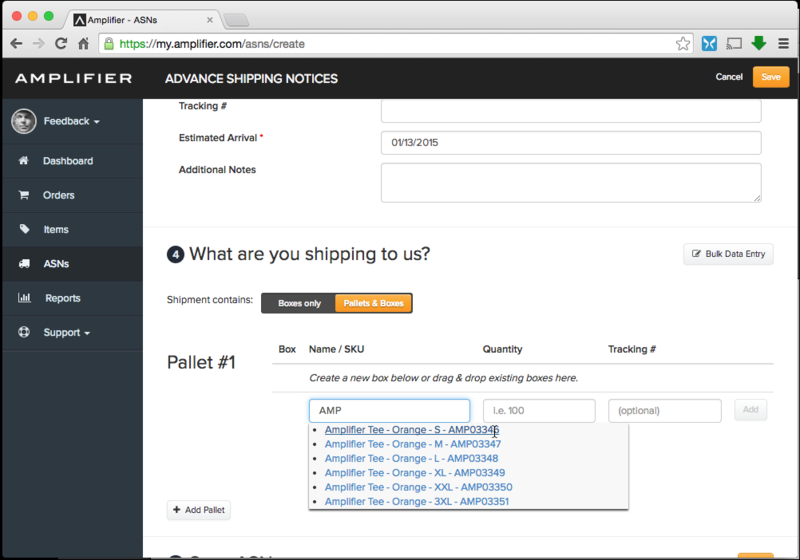 Tell us exactly how many units of your ITEM are in the first box and then click "ADD." You have now created your first box of your first ASN. Amplifier automatically makes this "Box #1." Note that it is very common for one SKU to span many boxes. (e.g. 400 T Shirts might ship in 4 boxes of 100 each.) 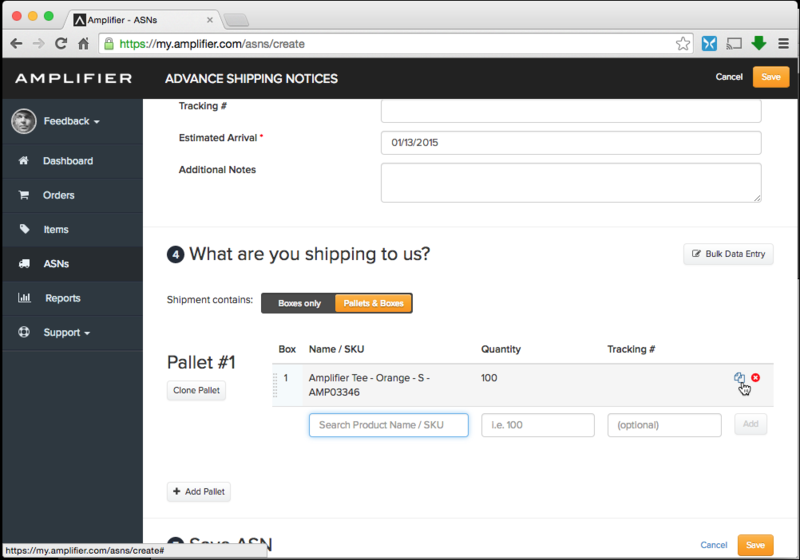 It is so common in fact that to make adding multiple Boxes of the same SKU easier, we added a button that allows you to "clone" a box and its contents. Simply click the Clone Icon shown at the end of the first line and we will duplicate that line for you. Clicking this three times gives us all four boxes of 100 units of Amplifer Tee - Orange S - AMP03346. Since you or your supplier has likely already built the physical pallet of inventory, you'll want to match "Pallet #1" in our ASN tool to your first pallet. Let's say you also added 315 Medium Amplifier Tees to the same pallet. Simply add that new SKU on the next line (AMP03347) and tell us about each box. In this case, let's assume there were 3 boxes of 90 Mediums each, and one box for the remaining 45 of the Medium Tees. Add the Mediums by repeating the same process you added the Smalls, enter the SKU and the QUANTITY. 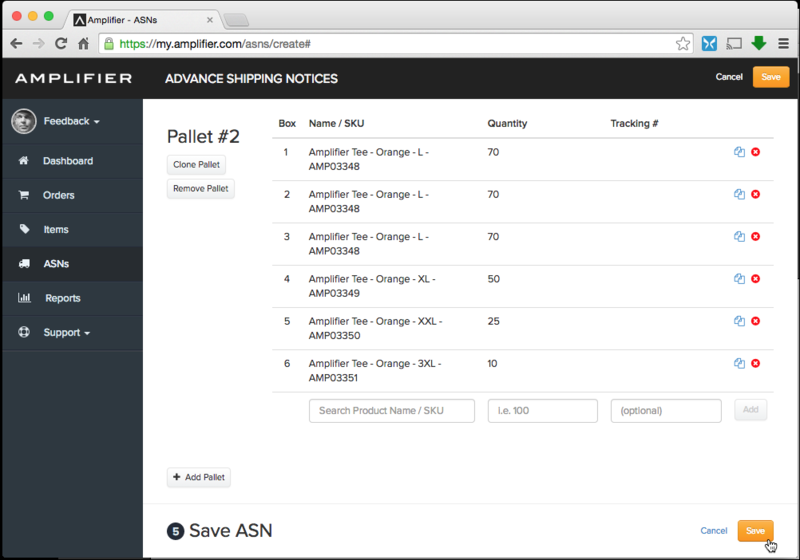 Once you've finished building all of your pallets, you are ready to submit the digital information about your ASN to Amplifier. Click SAVE to do so. You have now successfully completed the first part of your ASN submission! To confirm this, let's simply return to the ITEMS view and look at our catalog. Note the quantities now being shown under the QTY EXPECTED Column. Everything we said was on its way is now showing up as EXPECTED. The Digital work is now finished, so let's get Physical.